This beautiful statue features the Goddess Kuan Yin with the mystical garuda bird. The magnificent statue is embellished with lovely golden and white color, and is the perfect feng shui cure for protection against illness, misfortunes, negative chi, and hindrances. Also known as the omniscient mother, Kuan Yin is known for her benevolent abilities to heal the weakened, save the poor, and support the disadvantaged. In 2017, the illness star #2 is present in the NorthWest. 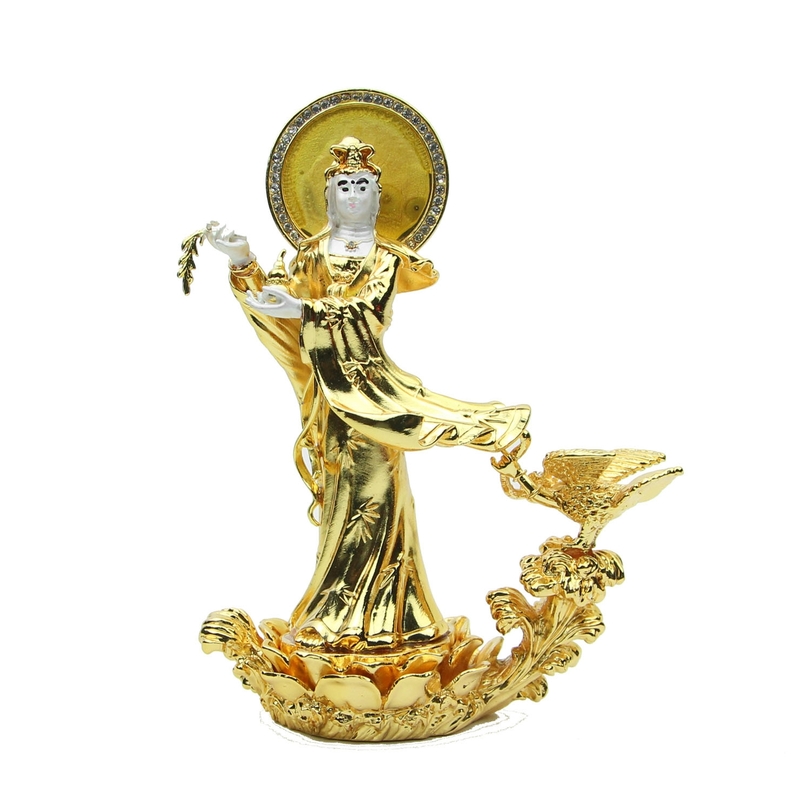 All are advised to use feng shui cures against this negative chi; patriarchs, and those born in the year of the Boar and Dog are especially advised to find protection with this Kuan Yin figurine. Carrying a Kuan Yin image or placing a Kuan Yin figurine in one’s room will protect one against evil doings, and enable one to find true righteousness and purity. As the Goddess of Mercy, Kuan Yin (also known as Guan Yin or Quan Yin) is respected and loved by all Chinese. Kuan Yin is loved for her omniscient ability to lead people to happiness and ease the world of sorrow and despair. Kuan Yin is popularly known in Chinese culture as the omniscient mother, savior, and compassionate comforter of the disadvantaged. Kuan Yin is the most popular deity on Chinese alters, and is widely respected for her benevolent and generous ways. Many Buddhist scriptures say that one can call on Kuan Yin’s assistance by simply calling her name; as the “one who hears the cries of the world,” Kuan Yin is known to assist people and lead them to happiness and peace. Kuan Yin is loved for her benevolent abilities to eliminate despair and instill inner peace in troubled souls. The Kuan Yin statue can be taken out from the lotus. The dimension of the Goddess Kuan Yin with Garuda is approx. 4.5" x 2.5" x 6". It is made of alloy.